The 80-year-old "passed away peacefully on Saturday after a short illness", the foundation named after him said. His home country, Ghana, has declared a week of national mourning. 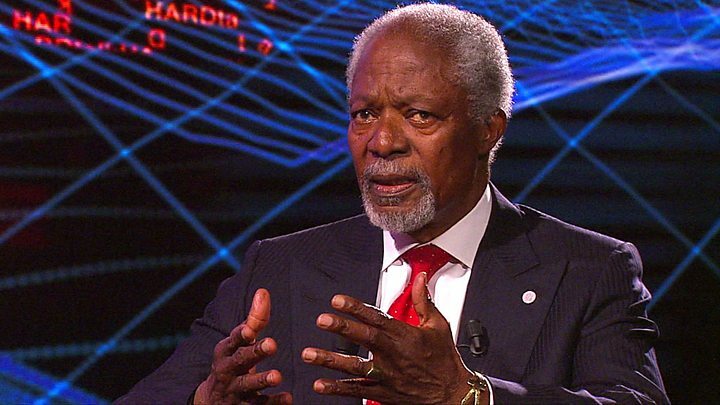 Annan served two terms as UN chief from 1997 to 2006, and was awarded a Nobel Peace Prize for his humanitarian work. He later served as the UN special envoy for Syria, leading efforts to find a solution to the conflict. In a statement announcing his death, the Kofi Annan Foundation described him as a "global statesman and deeply committed internationalist who fought throughout his life for a fairer and more peaceful world". "Wherever there was suffering or need, he reached out and touched many people with his deep compassion and empathy." The career diplomat died in hospital in the Swiss city of Bern. He had been living near Geneva for several years. He was awarded the Nobel Peace Prize in 2001 for helping to revitalise the international body, during a period that coincided with the Iraq War and the HIV/Aids pandemic. Kofi Annan described his greatest achievement as the Millennium Development Goals which - for the first time - set global targets on issues such as poverty and child mortality. However, Annan was not immune from criticism. His critics blamed him for the UN's failure to halt the genocide in Rwanda in the 1990s when he was head of the organisation's peacekeeping operations. Later, after the US-led invasion of Iraq, he and his son were accused of being involved in the "oil for food corruption scandal" that led some to call for his resignation, though he was later exonerated. Media captionAnnan told the BBC in April that the world had become "particularly messy"
In an interview with the BBC's HardTalk to mark his 80th birthday in April, Annan acknowledged the UN's shortcomings, saying it "can be improved, it is not perfect but if it didn't exist you would have to create it". "I am a stubborn optimist, I was born an optimist and will remain an optimist," he added. 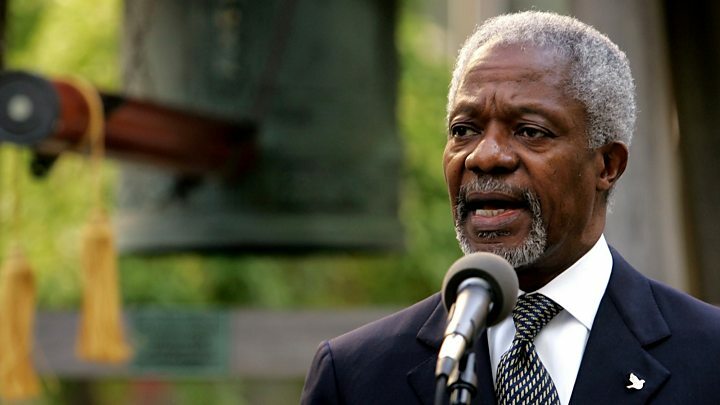 Kofi Annan will be remembered for the way he drew attention, over and over again, to the plight of those caught up in war, environmental disaster, or simply grinding poverty. The way he quietly but firmly reminded world leaders, however powerful, that they needed to put their duty to their citizens above their political careers. Current UN chief Antonio Guterres has been leading the tributes to his predecessor, describing Annan as "a guiding force for good". "In many ways, Kofi Annan was the United Nations. He rose through the ranks to lead the organisation into the new millennium with matchless dignity and determination," he said in a statement. Tributes have been pouring in from world leaders and diplomats, including UK Prime Minister Theresa May and Nato chief Jens Stoltenberg. Former US President Barack Obama, the first African American to win the White House, said: "Long after he had broken barriers, Kofi never stopped his pursuit of a better world." President Vladimir Putin of Russia said the memory of Annan would "forever live in the hearts of Russians". Indian Prime Minister Narendra Modi said "the world has lost not only a great African diplomat and humanitarian but also a conscience keeper of international peace and security". Announcing the week of national mourning, Ghanaian President Nana Akufo-Addo called Annan "one of our greatest compatriots". The diplomat's career continued after retirement from the UN, and in 2007 he set up his own foundation aimed at promoting global sustainable development, security and peace. A year later, his reputation was boosted after he successfully helped negotiate a power-sharing deal to end post-election violence in Kenya. In a Facebook tribute, Raila Odinga, the opposition leader who signed the agreement, called Annan "the man who stepped in and saved the country from collapse". In 2012 he was made chair of The Elders, a peace and human rights advocacy group started by South Africa's Nelson Mandela. The same year, he quit his post as UN envoy to Syria after only six months in the role, citing the failures of world powers to fulfil their commitments. He was later quoted as saying: "I lost my troops on the way to Damascus." His most recent role was chairing an independent commission investigation Myanmar's Rohingya crisis. 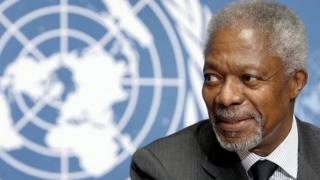 Annan's wife, Nane, and three children were "by his side during his last days", the Kofi Annan Foundation said.